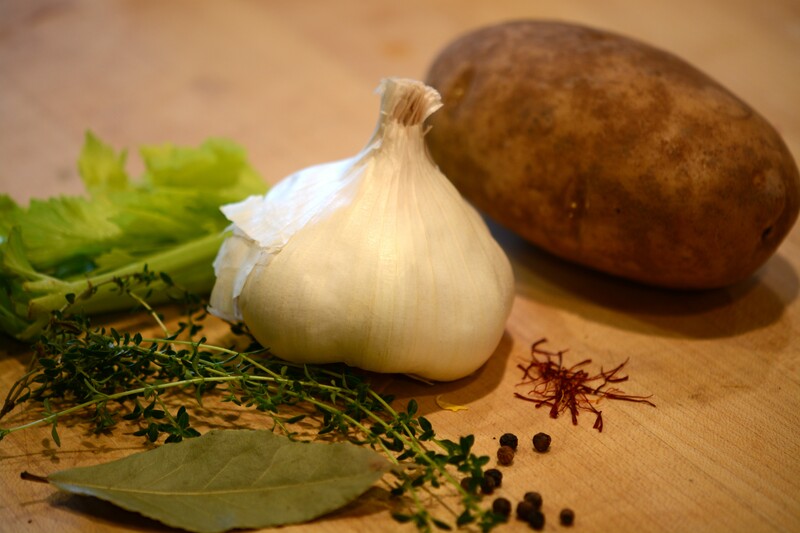 Separate the garlic cloves and toss them into a pot of boiling water. Boil for 1 minute. Remove from the boiling water and immediately plunge them into cold to stop cooking them. The garlic clove sleeves should come off cleanly. Heat the olive oil in a stock pot until fragrant and toss in the saffron, the thyme, the bay leaves, and the parsley and/or celery leaves. Add the water, the salt, the peeled garlic cloves, and the potato cubes. Raise the temperature to high until the mixture comes to a boil and then reduce the heat to a high simmer. Simmer the soup for 45 minutes. Remove the pot from the stove and using an immersion blender, blend the soup to a creamy consistency. It will be rather thin. If a thicker soup is desired, you can increase the potatoes. Taste, correct the seasoning, and serve.